Obama: 'I Am Absolutely Confident ... We're Doing Right Thing' On Immigration : The Two-Way Speaking in Miami, Obama said his executive actions on immigration will ultimately be upheld by the court system. Still, Obama said, the only way to solve this permanently is through legislation. President Obama waves after posing for photographs with MSNBC host Jose Diaz-Balart at a town hall meeting on immigration at Florida International University on Wednesday. President Obama said his executive actions on immigration will ultimately survive legal challenges by Republicans. "We're going to be as aggressive as we can because, not only do we know that the law's on our side, but history is also on our side," Obama said. 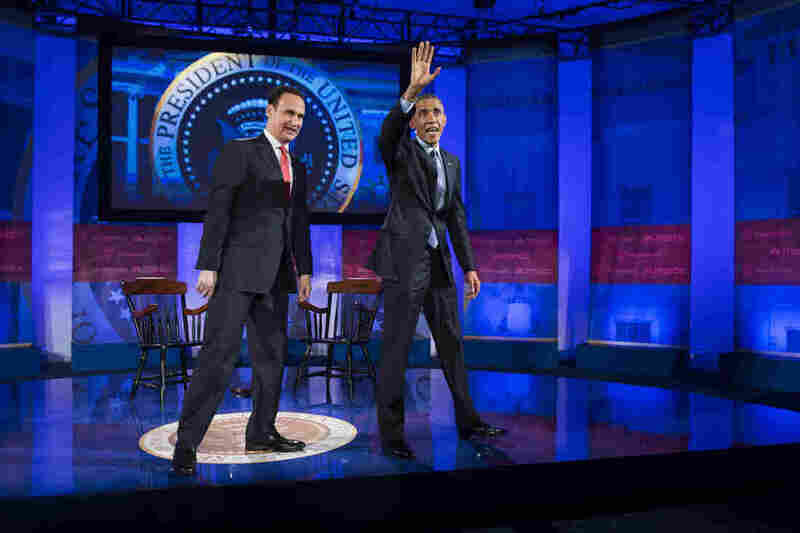 Obama was in Miami to take part in a town hall hosted by Telemundo and MSNBC. It was the first time Obama talked at length about a ruling by a Texas court that found he had overstepped his bounds when he provided temporary legal status to millions of undocumented immigrants. The administration has already appealed the ruling and Obama said they are willing to take that appeal all the way to the Supreme Court. Obama also warned Republicans about trying to legislate against his executive actions. "In the short term, if Mr. McConnell, the leader of the Senate and the speaker of the House John Boehner want to have a vote on whether what I'm doing is legal or not, they can have that vote," Obama said. "I will veto that vote because I'm absolutely confident that what we're doing is the right thing to do." Obama added that in the long term, this issue would be resolved because of the country's changing demographics. "This is going to get solved because at some point there's going to be a President Rodriguez or there's going to be a President Chen," Obama said. "The country is a nation of immigrants, and ultimately it will reflect who we are and its politics are going to reflect who we are." Obama was asked why he had left out the parents of DREAMERs and international students from his legislation and he said that his executive authority has limits. Ultimately, he said, the actions he has taken could be undone by the next administration and the only way to provide permanence is to pass a law. "In order to make sure that we don't have any heart-breaking stories with respect to immigration, we're going to have to fix the law," he said. "There are only so many shortcuts. Ultimately we have to change the law. And people have to remain focused on that. And the way that happens is, by the way, by voting."